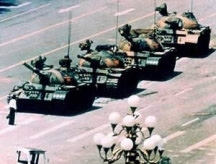 An unidentified man defiantly holds off a tank column in Tiananmen Square on June 5, 1989. The incident occurred at about noon that day. Certainly this man was unconcerned about what was in it for him. His focus lay elsewhere. At one point, he was surrounded by a crowd, into which he disappeared. Known only as the "Tank Man" to this day, his identity and fate remain unknown. See the PBS Frontline Web site for more. Photo by Jeff Widener/AP. In the past decade or so, "What's In It For Me" (WIIFM) acquired its name, and became a dominant tactic of persuasion and motivation in organizations. The underlying idea is that people are best motivated by self-interest. Many believe that whatever we're trying to accomplish organizationally, people are most cooperative when they clearly understand the direct personal benefits that result from compliance or cooperation. But there's much more to human motivation than WIIFM. We as humans also care about the well being of others, and of the groups we belong to. In part, that's why parents shield their children from danger with their own bodies, why soldiers willingly die for their countries, and why firemen who don't even know us run into burning buildings to save our lives. Yet in business we now rely on WIIFMs to motivate people for reorganizations, layoffs, downsizing, benefits reductions, office moves and most of the other difficult changes we make in the workplace. This is dangerous, because excessive reliance on WIIFMs can be toxic to an organization. Using WIIFM tactics helps to create or sustain a culture of WIIFM. When we give too much emphasis to WIIFM (and it doesn't take much) we send a secondary not-so-hidden message that acting in one's own self-interest is always acceptable, which implicitly endorses many other behaviors that damage the organization. A WIIFM culture is at a great competitive disadvantage compared with one in which employees are motivated not only by WIIFM, but also by a desire to advance the group. Persuaders who overuse the WIIFM tactic encourage employees to ask the WIIFM question about the persuader. Since in most organizational cultures, behavior that enhances the greater good without reference to direct personal gain is more prized than WIIFM behavior, encouraging people to examine the persuader's personal motives undermines the persuader's authority and stature. If the belief in personal advantage is strong enough, people can come to doubt the persuader's motives even in the absence of evidence of personal gain. than WIIFMWIIFM-oriented, employees interpret management's attempts to change anything in terms of leaders' WIIFMs. We call this "cynicism" when it happens, and it makes changing a WIIFM culture very difficult. WIIFM tactics do work in the short term. In cultures that acknowledge the value of more selfless motives, employees aren't yet accustomed to questioning the motives of the persuader. But with each use of WIIFM, persuaders re-enforce the WIIFM orientation of the employees, raising the minimum threshold of personal gain required to motivate employees in the future. For more on achieving and inspiring goals, see "Corrales Mentales," Point Lookout for July 4, 2001; "Commitment Makes It Easier," Point Lookout for October 16, 2002; "Give It Your All," Point Lookout for May 19, 2004; "Knowing Where You're Going," Point Lookout for April 20, 2005; "Workplace Myths: Motivating People," Point Lookout for July 19, 2006; "Astonishing Successes," Point Lookout for January 31, 2007; and "Achieving Goals: Inspiring Passion and Action," Point Lookout for February 14, 2007. Chinese culture, especially under Mao, placed strong emphasis on a value celebrating those people who acted selflessly, heroically sacrificing themselves for the common good. The posters, movies, songs, and stories from this era are international cult collector's items and have a "camp" appeal outside of China. Many are laughable in the extreme examples they portray. Within China selflessness is still emphasized in the schools, but within adult society there is a growing class of (relatively) very rich people who have corruptly leveraged their position within the party to their own benefit. These people are hated, envied, and admired, as you might expect. A more deeply embedded characteristic of Chinese culture is the concept of Guanxi. Guanxi is like an informal accounting system of favors done for people. In 1994-1995, Xucheng lived at my house, all meals, soap, toothpaste, toilet paper, everything, for absolutely free while he was an exchange teacher at a local elementary school for the school year. (He was the tenth Chinese man who lived with us.) When I visited his school (he is headmaster) I taught for free, and the mere presence of a foreign teacher enhanced his prestige within the community. But Xucheng is also the kind of fellow who is constantly doing favors for other people and is able to call upon them when he needs a favor. When we needed transportation and the school car was not available, he made a phone call and presto; we rode around all day in a police car! When I needed a doctor in Lipu, one showed up at my room, no charge. But most impressive of all, when I was 500 miles away in the city of Kunming and sick as a dog, within an hour after Xucheng found out about it an English-speaking doctor showed up at my hotel room with the medicine I needed. Believe me, if you were sick in a hotel in Saint Louis, I could not arrange that for you in a month of Sundays. There was a discussion on Jerry Weinberg's SHAPE Forum recently about how to say no when people ask you for favors — asking you to do work for them for free. I think we could learn something from the Chinese about how to say yes. I believe in Karma. Would you like to see your comments posted here? rbrenppxMcAoZDMyuipHyner@ChacXeSugONXMMeCqinmoCanyon.comSend me your comments by email, or by Web form. I offer email and telephone coaching at both corporate and individual rates. Contact Rick for details at rbrenfQNGWTcVJXTCaKIwner@ChacvJFnXkOEOJtBKONBoCanyon.com or (650) 787-6475, or toll-free in the continental US at (866) 378-5470.